The following conversation is not made up. Scott: Not really. Just ordered some last week. Why? Scott: [thinking Dustin found an old box that I might have left there.] Haha! Throw them away. They're probably an old prescription. Dustin: But they just came in the mail. Scott: [A realization] What!? Oh crap! Quickly pulling up the shipment confirmation email from 1-800 contacts, I discovered that I had changed my billing address... but not my SHIPPING address. During the Saturday evening performance of Music Man, the music director came up with a fun little way to "pass the time" during the show. We were each to come up with a haiku about The Music Man and turn them in at intermission. I think they're going to make some kind of collage eventually and post them somewhere. But here are the ones that I came up with. Enjoy! Tomorrow, I'm starting this training plan called One Hundred Push-ups. I stumbled upon the site a few days ago and contemplated what it would be like. I've needed to do some physical activity, since the majority of my job is just standing around at this point. So I'm going to do it. Starting in the morning, I'm going to make my way toward being able to do 100 consecutive push-ups. The program boasts that if you stick to it, and don't cheat yourself, in six weeks you should be able to do 100 consecutive good-form push-ups. I already did the initial test, and I could do about 20 good-form push-ups. So I figure I'll be at a good starting point in the program. Check out the website if you get the chance. I'll be posting my progress as I go. Well, Thoroughly Modern Millie is over, and we're now in the changeover process going into Joseph and the Amazing Technicolor Dreamcoat, which opens for preview on July 18. I had some good times running that show. This post is kind of a list of my favorite moments from the show. - Pamela (played Miss Dorothy) saying the line, "Trevor", always cracked me up. - Mamie (played Millie) declaring war on me to make me laugh during the show so hard my spotlight shook. - Trying to make Stacy (our Stage Manager) crack up when she's doing the backstage announcements over the mic to the actors. - Ben (played Jimmy) popping out of the laundry basket he and Mamie were hiding in with red lip marks all over his face. - Amy & Allan (played Alice & Bun-Foo) having a "boy-meets-girl" moment on stage every night. - Mamie singing the HELL outta "Gimme Gimme". That song was also my favorite for my spot cues. - Breaking Jana (making her laugh) in the middle of a cue. - Following along with the motions that Graham (played Graydon) and Mamie did during "Speed Test". As many of you many know, most of my time spent here in St. Louis is occupied with work. A typical week has me running up to 9 shows per week (2 on Wednesdays, Saturdays, and Sundays) as well as coming in to the shops to work on the upcoming show on the days we don't have two shows. This weekend was a little different. We only had one show on Sunday. A bunch of the crew and I had planned on going to City Museum after the afternoon show and go have some fun. Unfortunately, their hours on Sunday end at 5pm. We scrambled to figure out something else to do on our bonus evening off and landed on bowling. Bowling was fun and beer filled (as it should be on both counts), and we all played some arcade games prior to and after bowling. Later on a few of us went and played some Night Frisbee. One of the props people, Nick, has a Frisbee with LED lights on it, so you can easily see the disc as it's flying through the darkness. My official day off started with me sleeping in until 10am. That afternoon, I chose to explore a little more of my current locale. I found a giant, three-story mall that had a few dangerous stores for me to enter. It was the first time that I had ever set foot inside an actual Apple Store, and it was amazing! There was also a store called Sony Style (i think) that was entirely Sony products... who knew Sony made so much crap?! One of my downfalls is always a Godiva kiosk, and this mall had a whole STORE! I forced myself not to in, since I usually come away with about $50 in chocolate, usually in the form of various truffles. I grabbed some Chinese food in the food court, and headed out to do some more exploring. After the movie, I stopped in a Barnes & Noble to browse around, ended up not buying anything except a Vanilla Chai latte from the "Starbucks" inside. That evening people came over to the apartment to watch the Jeff Dunham DVDs I had bought at the mall. Not too shabby of a weekend, if I say so myself. (That's right two weeks ago) Logan, being the awesome roommate he is, and sensing I needed something to cheer me up, invited me out to hang out with some of his friends (most of whom I had met or hung out with before) at O'Neill's for a birthday celebration. We saw a really awesome 80's cover band by the name of Long Duk Dong. I had a couple of drinks there. Then a bunch of the gang decided to go to The Dame where they were having a Dance Night. I had a couple more drinks there, and I shook my booty until the wee hours of the morning. I had such a blast and it was just what I needed to blow off some steam. Thanks to Logan, Rebecca, and Rachel for helping me have such an awesome time! Saturday was sleep in and then go to work day. Crashed hard that night. More work, then went to William's to hang out and roasted some marshmallows and made smores in his fireplace. Pretty much same old, same old - work, class, sleep, and eat. Except I also went to a couple of rehearsals for The Music Man (which I was light designing). ... 7:00am when I took a shower, and printed out my plot to take to the Opera House. Got to the Opera House at 9:00am, and didn't leave until 11:00pm or later. Went home and did some homework (class and design), and got a couple hours sleep. Back at the Opera House again at 9:00am until 11:00pm. Had a meeting with Stage Manager, Director, and Assist. Director at Denny's afterwards. Got some sleep that night, but had class in the morning. Back at the Opera House at 1:00pm to finish up design stuff. Left at ... guess ... that's right, 11:00pm. Slept most of the day, because I needed to. Went into the Opera House to give the Stage Manager and Master Electrician some final instructions for opening night. Then I headed over to my friend Sam's house to work on a video project he was working on. It was so funny. I can't wait to see the footage he shot! That's my past two weeks in a slightly larger than normal nutshell. I'll post more details about the Music Man at a later time. That was such a rewarding experience! Sometimes you find yourself in a very familiar situation. Sometimes these situations are unpleasant... then others make you feel great. I'm in Richmond hanging out with a couple of really good friends. It feels like no time has passed at all, as last year (has it really been that long?) coming to the coffee shop was a very standard occurrence. We just hang out, have good conversation, and surf the web. Today, I was helping Katie with a project for a graduate class she has. It happens to deal with creating web pages. Dustin did a lot of the grunt work, I'm really just an extra pair of eyes and a fresh mind. Anyway, the whole point of this is to say that this familiar feeling is nice. Today is March 14, also written as 3.14. In celebration, I'm going to have Pie tonight after work. How are YOU going to celebrate Pi Day? Okay, so you know that I went to SETC last weekend. I accomplished two goals while there. 1) find a job 2) hang out with some old friends. I got to visit with mom and with some of my family while up there. This was really nice since I wasn't able to see any of them over Thanksgiving or Christmas due to the Bullseye claiming dominion over my soul. On Monday, I got my first job offer as a result of SETC. It was a HUGE load off my mind. On Wednesday, I got my second offer. All this was a tremendous relief of stress. I felt I had interviewed well, but you just never really know what the other side of the table is thinking. Drove home this morning since I had to work tonight. I almost didn't hate going to work tonight. The weather was AMAZING! It's one of the only times I've been grateful for having to work outside (aside from Summerstock jobs). More info on the job (and life) front as it rolls in. Later! Remember when I used to be better about updating this thing? Yeah. Me too. Sorry if you're been a little confused lately about the fact there has been no skipthehero to check up on... when I moved, I also moved banks, forgetting to change the information for my web host. I finally stopped being lazy and fixed it, so I'm back... with a giant-sized update! Life hasn't treated me too badly since last time I posted. Work and school and a little bit of social life have taken up most of my time since October. I finally got my driver's license back in January. Vehicular freedom is WONDERFUL! The holidays were really difficult for me this year, I'm used going to visit my mom and spending the time with a HUGE family... this year, due to work and my lack of a driver's license, I wasn't able to have that at all. Luckily, my friend / roommate Logan kidnapped me on Thanksgiving to take me down to his family's house. And mom was able to make it down for Christmas Eve... but it wasn't the same. :( That plus the fact that last year I had an amazing person in my life and this year I didn't, made the holidays a little less vibrant and a little more sepia toned. Right now, I'm just trying to make it to graduation in May, while keeping myself sane with the free time I have available. Work is going well. It's been going even better the past week since they made a new policy not to keep Cart Attendants past 9:00. In my free time, I've done a little bit of rock climbing at EKU, learning how to walk on stilts, and played board games galore with a really fun bunch of people I met via my friend William. One night, we had a "Pride & Prejudice Party" where a couple of people made a bunch of traditional English meal items (Cottage Pie, Bangers and Mash, A Triffle, etc) before watching the (marathon of a) movie, Pride & Prejudice. At intermission, we had tea and scones! Later this week, I drive down to Chattanooga, TN, for Southeastern Theatre Conference (SETC). While I'm down there, I'll be able to connect with some old friends / colleagues, and do some job searching for after graduation. It's been a few years since I attended SETC since I only really ever needed summer work, and Jenny Wiley was always willing to offer it. This event is to find work for the other 9 months of the year. I'll probably blog at least once from SETC, and let you know how it goes. 1. For One More Day by Mitch Album / First book Erin gave me. It was a present on our first christmas together. 2. The Alchemyst by Michael Scott / A book given to me by a very good friend for my birthday this past summer. 3. The Chronicles of Narnia by C.S. Lewis / The first books I remember reading for fun. 4. The Purpose Driven Life by Rick Warren / This book helped me build a stronger and more personal relationship with my Lord and Savior. 5. The Harry Potter books by J.K. Rowling / Because it's always fun to take an amazing journey with characters you love, and even more fun to take that journey with friends and discuss the books with them when you're finished. ... and by fun, i mean work that is mildly amusing. This is our third assignment for my Electronic Publishing class. The first two were nothing big, just teaching us to use Adobe Illustrator. This one has us using Illustrator for something potentially useful. We were supposed to either draw something free hand or "trace" an jpg image we already had. I chose to trace a pirate devil duck that Erin's sister, Abby, gave me for christmas last year. Here's the one I made. I'm at the theatre while the designer and director write light cues for West Side Story. I'm bored. I have to be here in case I'm needed, but I don't have any real work to do until the end of the night when I strike gear. A couple of the ladies in the cast and I started txt msging back and forth. It got really fun with one of the girls sending me "secret admirer" messages since I didn't have her number. The was all kinds of fun being sent in digital form. It was definitely the most number of txt msgs I've ever sent and/or received in one day. I think the tally came up to over 60 msgs total... sent and received. The awesome thing was, they were doing it to keep me entertained while I was bored at work! Here's to Meg, Anabel, and Nicole! Some of the coolest gals I know! Thanks ladies!! You made my night!! i'm getting bad at this. First off - Happy 07/07/07!!! Today is the day the seventh Harry Potter book should've been released. Anyhoo... life's going pretty well here at Jenny Wiley. We've got three of the four shows up and running and the fourth (West Side Story) starts technical rehearsals on Monday. I've been a bit miserable this past week due to a fairly nasty sunburn I acquired on a day off while out on a pontoon. Luckily, I've had a really great person to apply aloe to my back. As of this writing, I've finally met all the actors, and had some good conversations with more than a few. There are still a few allusive that I'm trying to open up to me, but the majority of the company is great fun! In fact, all of the residents of Cabin B are pretty much addicted to the Discovery Channel. Dirty Jobs, Deadliest Catch, Mythbusters, and Man vs. Wild is pretty much on the TV anytime we're home. The shows are going great so far and High School Musical is a lot better than I anticipated. I avoided watching the movie and listening to any music prior to the summer in order to not get burned out on it. This group of actors is probably the most talented (overall) that I've seen at Jenny Wiley. There really aren't any weak-links in the chain. The production crew is amazing as well. They've put in so many long hours in order to get the past couple shows up... and they've done so without complaint. They're here to do their job. In other news - I was fortunate enough to get to talk with Erin a couple times this past month, which was a real blessing! It was fun talking with her again. Nice and normal. Anyway - a few final words before I head out. "Enjoy the journey or the destination will pass you by." I decided I needed to write a quick update so as not to go a whole month without posting. The past four weeks have been pretty good. The production crew is all really talented and mostly fun to be around. The acting company has all arrived and started rehearsals for High School Musical. I've only met a few of the gang, but those I've met seem to be pretty cool. This past week was load-in, setup, and tech week for Forever Plaid. I had a few long nights of work, with most nights getting to bed around 2 or 3am. I ended up having to pull one all-nighter in order to get lightboxes ready to be installed the next day. Luckily the past couple days have been a little less stressful and easy-going in lighting world. We opened up Forever Plaid to a great audience. This coming week, we tech and open up the kids show, The Princess and the Pea. It might be another high-stress week as there are times when the crew needs to be in two places at once. A few of the actors from last year have returned, including one of my favorite people from last season, Katie Mitchell. We've had a couple of really awesome conversations since she's gotten here, and it's the first time this summer that JWT has felt like the home it has the past 6 seasons I've worked here. All in all, everything is going fine. I miss my friends who are strewn about the globe very much, and think about everyone often. Stephanie & Chris - I'm very excited about seeing you at the end of the summer! Dustin & Katie - I hope you guys are having a blast in France! Erin - I hope you're having a great summer and that things continue to go well for you! JWT is not quite the same without you here. Well, I've been in Prestonsburg for a little over a week so far. We've gotten a lot accomplished, and start to hang lights tomorrow. That's my favorite part of the season, because that's when I can see physical proof of my accomplishments. As usual, only the production crew is here right now. It seems like we have a good bunch of folks again, this year. With the exception of one particular year, and a couple of exceptions over the past couple years... most of the people have been really great to work with. fun with iMovieHD and Garageband. This was the final project due for my TEC355 Web Animation class. Cheesy and fun. Like me. Enjoy! The past month or so, I've been evolving a plan in my head about what to do after graduation... especially now that I can finally see an end to my undergrad years. I haven't told too many people this plan, nor is it anything set in stone, but it is definitely something I need and want to do. Starting now, I have one year and a week before I graduate. I plan on working this summer and working while taking classes this next school year. Hopefully, I'll be able to save some money, pack up a bunch of crap, and live and work in London (England) for 6 months. I've learned of a program called BUNAC that helps college students or recent graduates find work abroad for up to 6 months. It would be an amazing opportunity. Not only would I be working in another country, but I would get to spend some good quality time with Stephanie and Chris. I would also be able to really enjoy the culture... something I wasn't able to do the last time I visited. Should various factors prove inconvenient, I will still save up money, and go visit for a couple weeks. I just won't be making any money during my visit. I whore myself out to afford a plane ticket to London and become a street performer. The IM guys came in this weekend for another event at First Baptist, which is always fortunate for me, because that means I get to hang out with some of the coolest bunch of guys I know. Thursday evening, Ben and I hung out at my local haunt, Live Wire, and had some good conversation about life, love, and relationships. It is one of the two most recent conversations I've had that have made me feel a little bit better about things. If Erin W. is reading this, I'm sorry if I've acted like a douche, and thanks for your caring and patience. I had an eye doctor appointment in Lexington in the afternoon. I finally am wearing contacts again after running out of them over two months ago! It feels good to wake up in the morning and be able to see. I'm pretty excited because my prescription didn't change hardly at all. (whoo hoo) Hung out with Ben and Topher a while that afternoon. That evening hung out at Live Wire some more and caught part of the Jazz Crawl that took place in downtown Richmond. I've never in my life seen so many people crammed into that small coffee shop! Back at the ranch, some friends were in town, and we played a card game called, "Oh Hell". Good times, good friends. Slept in. Went to St. Awesome's at 3:00 to volunteer as Video Switcher. For those of you not "in-the-know" the video switcher is the guy that sits in front of a lot of buttons and a wall of TV monitors and "switches" from Camera 1 - to Camera 2 - to a DVD playback - to Camera 3 - back to Camera 1... etc. Of course this is all done via input from the Video Director. It was fun. It was also my last weekend volunteering before my summer gig at Jenny Wiley. Another thing that made it fun was that it was something different, and it was challenging. I love working outside my normal comfort box and learning new things. That evening, my friend William had a housewarming party at his BRAND SPANKIN' NEW HOUSE! Not only is his house awesome, but we all had a lot of fun, and I met some really cool new people, too. The morning came way too early, as it usually does when I volunteer on the weekends. At St. Awesome's at 8:15am to continue my Video Switcher role. After the last service, Matt, Casey, Patch, Tim, and I grabbed some quick lunch from Backyard Burger, and headed back to the church. Back at the church I helped lead a Lighting Seminar with Matt for the rest of the guys. It was fun, but I'm so horrible at that kind of thing. I teach much like I learn, by doing rather than being told how. After the seminar, I went back home and crashed hard. Slept for a few hours, then did homework, and went to bed. Woke up to some troubling news about a fire in the Paddy Wagon. The Wagon was a cool Irish Pub downtown. By far my favorite watering hole in Richmond. The truly scary part for me was that my favorite place to hang out was only a couple doors down from the pub. Luckily it was only closed for the day (due to that section of Main Street being blocked off), and it reopened on Friday. To console myself, I grabbed General Tso's chicken from Tsing Tao. I spent most of the day finishing up my costume design project for class. We had to design costumes (and changes) for two of the main female characters in Fallen Angels. When I get all my projects back, I'll scan them in or take a photo of them so you can see what I've been up to in that class. Went to class and my teacher was very impressed with the progress that I've made since the beginning of class. He was very complimentary. This project had to be painted in watercolor. I'm terrible at painting, but we've been practicing in class, and his comment made me feel much better about my work. While sitting at home, I got a call from Ben. He and his wife were in town! A pleasant and unexpected surprise. We went to dinner at Casa Fiesta and caught up a little bit. They were in town for a funeral of a friends mother. :( So a good thing under not-so-good circumstances. Later that night I went to another local watering hole with my friends Casey and Michelle. One of Casey's friends was playing at the place that night and so we went and listened for a while. I originally had other plans for this weekend, but they were sort of changed, so I was able to enjoy relaxing at home for a little bit, watch TV, and straighten up the room some (not serious cleaning, just a little). Later that night, I met Ben, Rebekah, Chris and his friend at Miyako's for sushi! We actually sat in the sushi bar section since Rebekah finally realized she likes sushi. :) After dinner, Ben, Rebekah, and I hung out at Rebekah's parents house. We chatted, watched some stand-up, watched a little National Treasure, and Ben and I played a little bit of Lux. Woke up and went to church at St. Awesome's. 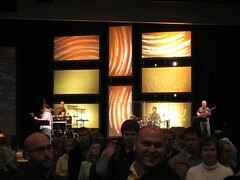 They started out the service with a Mute Math video. Pretty sweet. Went home and lounged around for a while. Dustin, Katie and I hit Qdoba for dinner, and then I went into solitude to relax, watch TV, and read my homework for class the next day. Inspiration abounds after I saw this on Erin's livejournal. One dream for each year of life. That's 28 for me. Here they are in no particular order. There's my list. Now it's your turn. 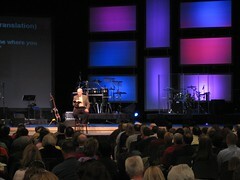 I setup and ran lights this weekend for the Easter services at St. Awesome's. The energy in a room of over 1000 people singing in praise of their creator is just simply put, incredible. Normally to setup for a weekend, we meet about 1:00pm on Saturday. Since this weekend was a bigger event, and there were a lot of things that were being added and incorporated, there were about six of us that showed up on Thursday and Friday evening to get jump start on the setup. 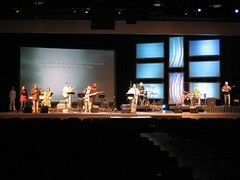 It was probably one of my favorite stage setup's we've done at church. Here's a couple photos I took this weekend. Click on them to see a larger image. What a beautiful day today was! Today started out slow. I slept in (Ahhh) and then worked on cleaning the room up and doing laundry. Around 2:00, my friend William called. So I took a break from the cleaning (hey, it's my Spring Break, after all) and headed up to Lexington to play around of Frisbee Golf with him and his friend Daniel. I did better than I expected, especially for it being the first time I played this year. Then we grabbed some grub at a new place called Culver's. Really good burgers. They server frozen custard, too. Yummm. Afterwards, came home and continue to clean and finish the laundry. My last class before Spring Break was finished at 1:20pm. In celebration I went to LiveWire and hung out. I read some of a book I'm reading, and worked on my computer a little while. Dustin and Katie joined me later, and then we all went and ate at the happiest place on earth. Qdoba finally opened in Richmond! And not only did they open, but I got my Chicken Queso Burrito for FREE, thanks to my Qdoba Card! When we got home, I helped Dustin and Katie make cakes and desserts that they're taking to her family tomorrow. Later this evening, Erin called from SETC and reported a long, fun-filled day. :) Everybody wish her luck and send her good thoughts and prayers. She auditions on Saturday morning. - All my classes for Friday are canceled. - Next week is Spring Break. I'm going to go visit some friends in Nashville. - Today was a beautiful day outside. I didn't have to wear a coat. - Dog Judo. Funny website. Check it out. - I'm officially in a funk. Bummer. - I auditioned for a show. I really loved the script. I didn't get a part. - I need to finish cleaning my room. - I need to clean out my car. - I need to do laundry. Made this Animated GIF for my TEC 355 class. Traveled down to Berea last night after class with Chris G. One of our friends from my Graphics Comm/Web classes (Logan) is in a band, Delorean Grey (myspace), and invited a couple of us to see his band play. They were awesome. But I can definitely tell that I'm getting older. The music was way too loud. They did a great job, though. The lead singer's voice reminded me of the lead singer of Incubus. The concert was fun, and on the spur of the moment. Some of the best kind of moments to have. This little guy here (and in my sidebar) was created at wee world. When ever I update his look on weeworld.com, his appearance will automatically update on my blog. Here he is sporting a winter coat, hat, and scarf. Brought to you by my wonderful girlfriend. Make a post to your live journal or blog. The post should contain your list of 10 holiday wishes. The wishes can be anything at all, from simple and fandom-related to medium to really big. The important thing is, make sure these wishes are things you really, truly want. If you wish for real life things, make sure you include some sort of contact info in your post, whether it's your address or just your email address where Santa (or one of his elves) could get in touch with you. Also, make sure you post some version of these guidelines in your live journal or blog. Surf around your friends journals and blogs to see who has posted their list. If you see a wish you can grant, and it's in your heart to do so, make someone's wish come true. Sometimes someone's trash is another's treasure, and if you have a leather jacket you don't want or a gift certificate you won't use--or even know where you could get someone's dream purebred Basset Hound for free--do it. You don't have to spend money on these wishes unless you want to. The point isn't to put people out, it's to provide everyone a chance to be someone else's holiday elf--to spread the joy. Gifts can be made anonymously or not--it's your call. There are no rules with this project, no guarantees, and no strings attached. Just... wish, and it might come true. Give, and you might receive. And you'll have the joy of knowing you made someone's holiday special. 1. A closer relationship with God. 2. To not be a burden on people, whether it be family, friends, or society. 4. More time with my girlfriend. 5. For everyone I love to be in the same room at the same time. 6. To be able to give Erin the present she really wants for Christmas (and that I really want to give her). 7. To be with Stephanie and Chris. I miss them so much, and I'm not sure when I'll get to see them again. 8. Wisdom. For everyone. An end to ignorance. An end to warring nations. 9. For all of my loved ones to have a safe travels and happy holidays. 10. To know that my dad is proud of me. This is just a small example of why I have some of the best friends in the world. Last week: Pretty much the normal stuff happened. Class; homework; lunches at LiveWire with Dustin (always highlights of my week); job searching. I also had a job interview at Hastings. We'll see how that winds up. Friday I went to good ole Prestonsburg to do some work for JWT. It was a decent day's work, and as a bonus, I got to see a lot of old friends who were in for "A Christmas Survival Guide"... I enjoyed my visit with everyone and probably would've enjoyed it more if I hadn't had a horrible cold. My front passenger seat was filled with used tissues, and i called it my "rolling bio-hazard". I woke up really early on Saturday morning to take a 5 hour drive from Prestonsburg to Columbus. I then drove mom and I to my girlfriend's parent's house in Newark in order to watch the biggest college football game of the season. The OSU v Michigan game. Her parents were having a small get-together and it was the first time her parents and my mom got to meet. I think they got along very well! That night, my mom, Erin and I drove into downtown Columbus to see The Kings Singers in concert. (by the way, they have a myspace page now... so check 'em out) The concert was amazing as always. The six men that make up this group can create sounds with their voices you wouldn't think possible. On Sunday, Steph, Chris, Doris, Erin, my mom, and I went to lunch together since we didn't have much change to really chat the day before. They all met at my mom's house and those who hadn't been there before got the quick nickel tour before we left to eat. After lunch we all split up and went our separate ways. After a little more visiting with Erin and my mom, I headed back home. I crashed early Sunday night... still quite sick from my cold. So far this week has been pretty much business as usual, except I went to see the new bond film with Steph and Chris (which was really good!). And they blessed me not only with their company, but also with a late birthday / early christmas gift. An awesome fossil watch! I've been wanting a dressy watch for a while now, especially lately as I've been in so many weddings, my brown leather everyday watch seems a little blah for special occasions or when I'm wearing a suit... so I know I'll get a lot of use out of it. Okay... now, back to work... i have a paper due for my class tonight... yuk! Me: (in a deep mexican accent) Hola, que tal? Chris: (in his british accent) Hello? Chris: I'm sorry, I must have the wrong number. Me: Chris, Chris, Chris! It's me, Scott.